Unquestionably one of the biggest rock bands of the 1990s, Pearl Jam, in many ways, were the star students of the grunge class. Though they didn't have the defiant, punk attitude of Nirvana nor the we-love-Sabbath metal edge of Soundgarden, the quintet found a huge audience for their relatively straightforward rock, thanks, in large part, to frontman Eddie Vedder's intense persona and distinctive vocals. As the band grew to resent their success, their music became intentionally less accessible (and often more intriguing), and while their peers folded, Pearl Jam found themselves with a smaller, but still loyal, fanbase by the first years of the 21st century. 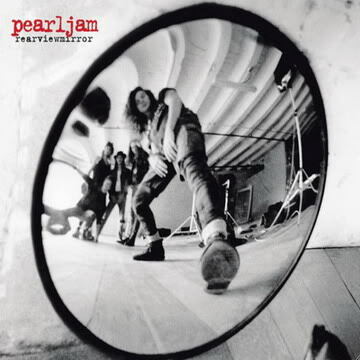 Although this two-disc set draws from the first 12 years of Pearl Jam's history, its focus is clearly on the group's heyday, with more than 20 of the 33 tracks dating from 1991-'95. The collection is cleverly divided into an "up side" and a "down side." The former features PJ's more rocked-out songs (the ominous "Once," the joyous "State of Love and Trust," the scathing "Not for You"), while the latter presents the ensemble's mellower tunes (the jangly "Daughter," the Eastern-tinged "Who Are You," the '50s ballad "Last Kiss"). Though fans may bemoan certain omissions, REARVIEWMIRROR shines the spotlight on underrated songs (the fierce "I Got ID" and the gorgeous "Off He Goes") and offers an excellent overview of this formidable band.